The US Embassy’s complete data for 2016 is now out! Smart Air analyzed the data to see if China’s air got any better in 2016. There are a few reasons to think 2016 was a good year. China has moved to tighten standards on gasoline and diesel and increase renewable power. 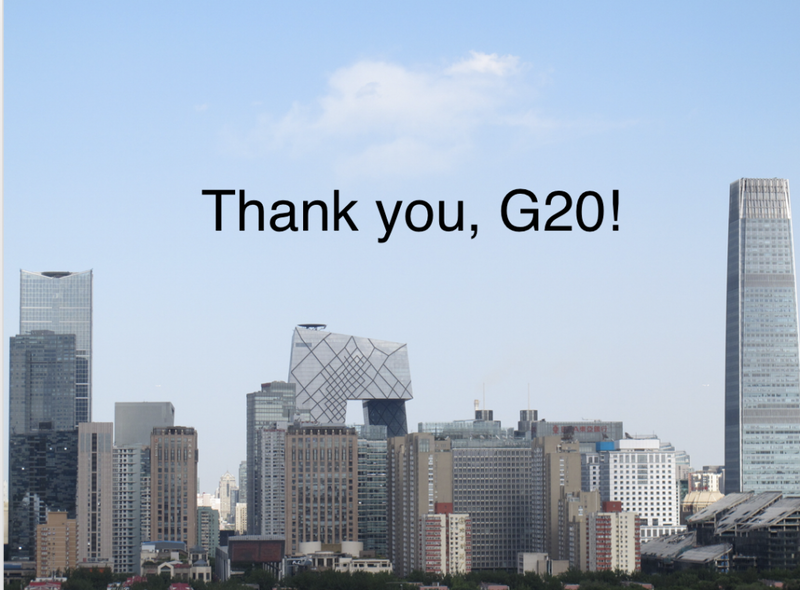 2016 also saw the G20 meeting, which came with extended factory closings and blue skies from Hangzhou to Beijing. 2016 averaged 73 micrograms, a full 31 micrograms lower than the peak in 2010 and 10 micrograms lower than 2015. 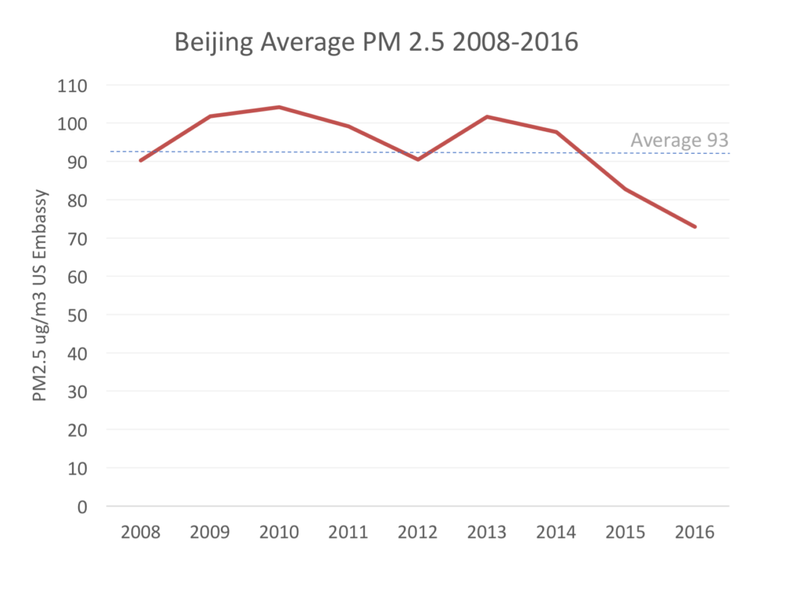 Beijing’s PM2.5 has decreased each year since 2013. 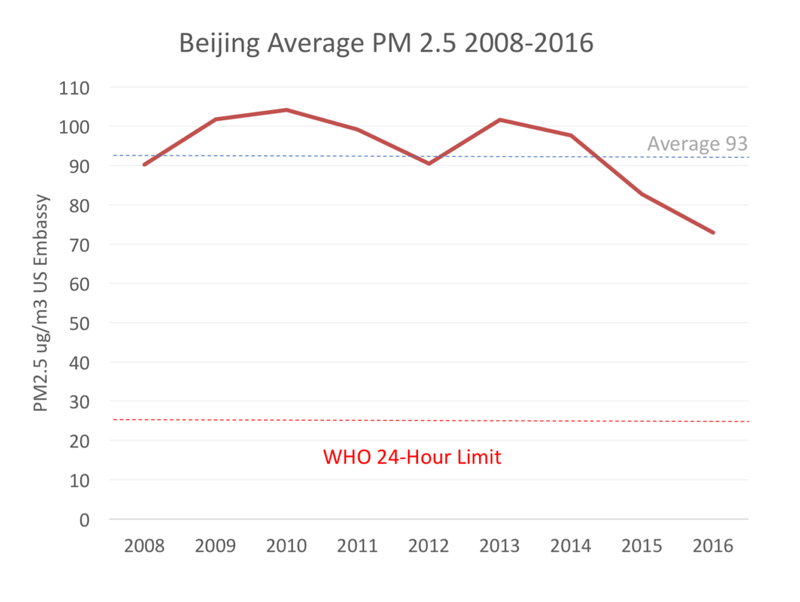 Despite that improvement, Beijing’s air is still three times the World Health Organization’s 24-hour limit. And 25 is really a loose limit because studies have shown that even levels below 25 micrograms harm human health. A stricter limit is the WHO’s annual limit of 10 micrograms, which is the average in cities like San Francisco. 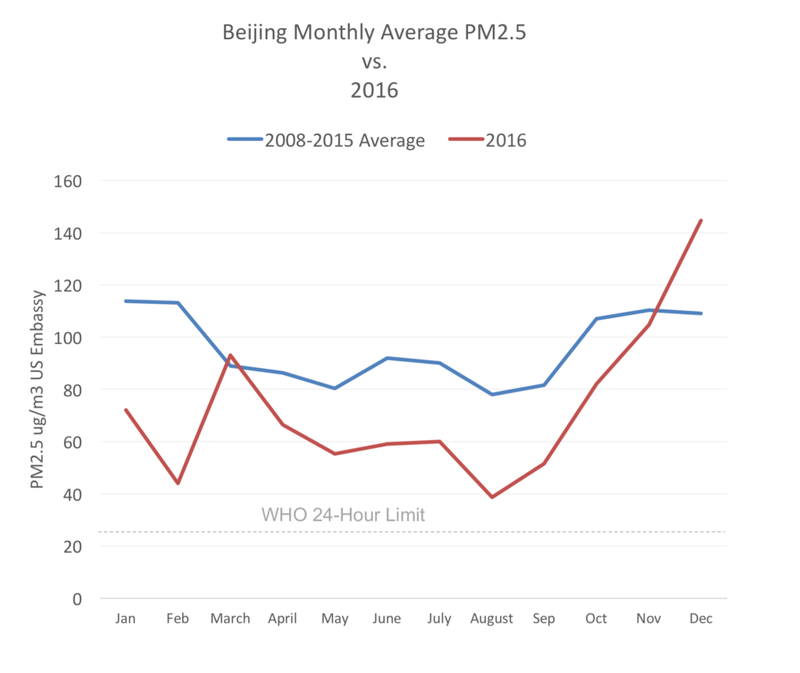 That declining average also masks a bad November and December for Beijing, when PM2.5 shot up above the historical averages. We analyzed data from US Consulates in other major Chinese cities. The data showed that 2016 was a good year across China. 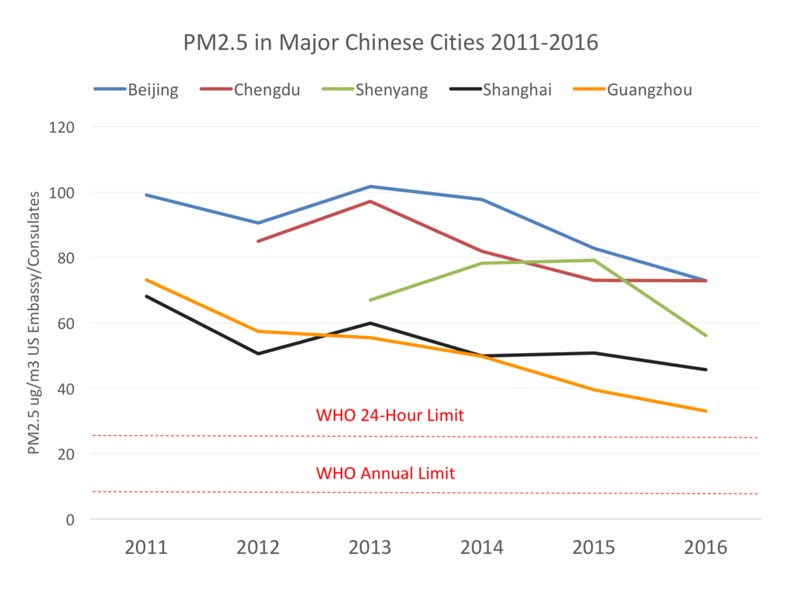 PM2.5 was down in 2016 for four out of five cities. 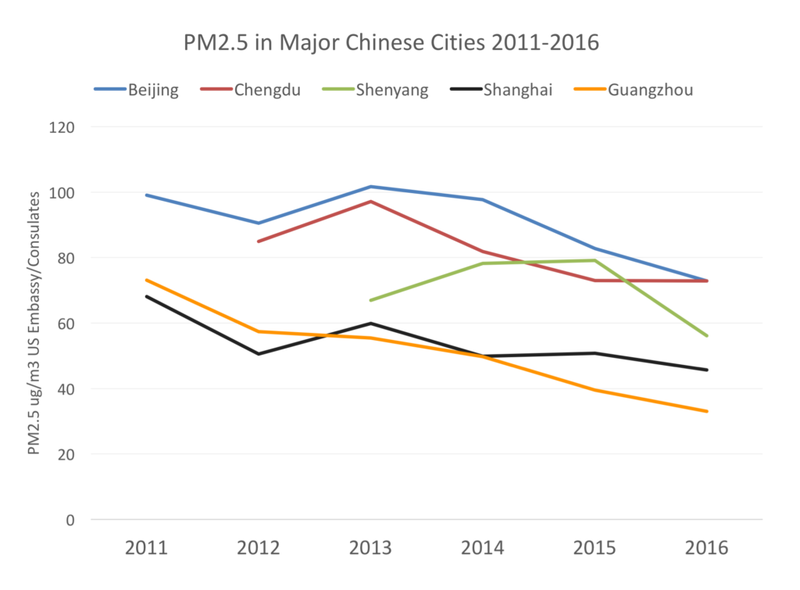 The only exception was Chengdu, which was flat at 73 micrograms—and now tied with Beijing. But “getting better” does not mean “safe.” All five cities are above the WHO’s 24-hour limit and at least several times the annual limit. PM2.5 dropped across China in 2016, but air is still far from safe.